Berlin Community School had award winners at this years Medford Memorial Jazz Festival. Left to right are Michael DiPascale, Matthew Wright, Hailston Virgillo, Ava Johnson, Daniel Fhan and Eli Kelly. Berlin Community School had members of its jazz band travel to the Medford Memorial Jazz Festival Thursday, March 21, at Medford Memorial Middle School to compete against other area bands. Director Skip Spratt said the students played very well and represented the school phenomenally during the competition. The jazz ensemble performed together during its performance, with Eli Kelly having a solo, being featured twice as a trombone player. Kelly was named Outstanding Soloist at the competition. Also, the judges rated the best section of the jazz ensemble’s performance during the competition. “The band as a whole got a gold rating with a score of 95 out of 100, and the saxophone section was rated the best section of our band,” Spratt said. 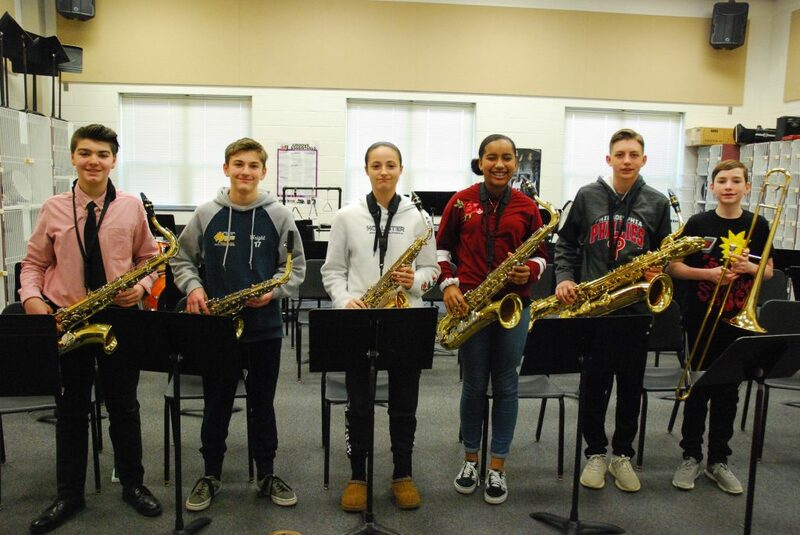 While students at BCS can play in the concert band through the school without tryouts, they can also try out for the jazz ensemble, as with extracurricular activities such as baseball or basketball. According to Spratt, the jazz ensemble has performed very well during this school year at festivals and competitions, despite Spratt having missed the past two due to personal reasons and being sick, even leaving them without a conductor for one of the festivals. The jazz ensemble adds plenty of extra work for those in it, however the students say they are beyond happy to be in the jazz ensemble year after year. Matthew Wright said he knew going into concert band at BCS that he wanted to one-day join the jazz ensemble, and looked forward to working up to make it to the next level. Kelly, who was named Outstanding Soloist at the ensemble’s most recent competition, says he’s always wanted to play music. “I’m really passionate about music, I really like playing the trombone and I really enjoy doing jazz band,” Kelly said. Daniel Fhan, who’s also a baseball player at BCS, says he’s enjoyed the challenge of taking his music interests to the next level.